B&W Zeppelin Air review | What Hi-Fi? 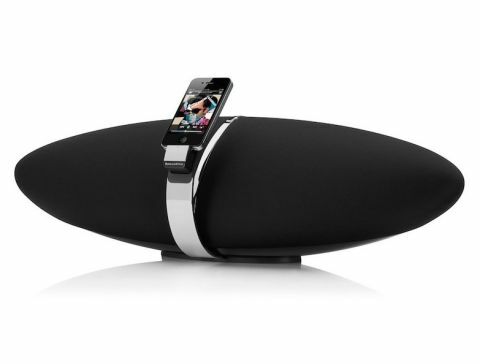 Saying Bowers & Wilkins has made a decent fist of making iPod speaker docks is like saying Apple has sold the odd iPhone. The British speaker manufacturer boasts some remarkable success stories in this product category over the past few years. It’s fair to say that B&W’s original Zeppelin set the benchmark for premium iPod speaker docks, proving that there was both scope and demand for a quality desktop system positioned way above the tinny-sounding sub-£100 pieces you find clogging up many shop displays. The Zeppelin Mini has enjoyed amazing success, too. Despite its smaller stature, there was no dip in sound quality. And, if anything, the new dock highlighted areas where its big brother could be improved. But now, B&W is no longer out there on its own. It has to share the premium market with rival speaker docks from the likes of Arcam, Philips, GenevaSound and Bang & Olufsen. Arcam’s rCube was responsible, indeed, for demoting the Zeppelin to four stars back in our November 2010 issue. So, it would appear that this is the perfect time for a replacement – and for B&W to take aim at the top spot. Ladies and gentlemen, please be upstanding for the new Zeppelin Air. “Erm,” we hear you mutter beneath your breath, “it looks a lot like the older one.” Perhaps; but, while the iconic shape and style of the original remain intact, virtually the only component the Air shares with its predecessor is the 30-pin iPod connector. All the drivers are new (see picture above), as is the Digital Sound Processing (DSP) chip, and the 12.5cm woofer now has lower distortion and greater throw, so you can push it louder and harder. Look closely and you’ll also see that the cradle now bares the manufacturer’s full name along the bottom instead of a logo. The infra-red receiver lies just behind the brand name, which means it’s easier for the unit to respond to prods on the pebble-like remote control. The ‘Air’ in the Zeppelin’s name comes from the inclusion of support for AirPlay, Apple’s music and video streaming technology. This means you can now stream music wirelessly from an iTunes-toting device, including a Mac or PC. Only an iPod Touch, iPhone (3GS or 4) or iPad running Apple’s iOS4.2 and above will stream using AirPlay. Set-up for AirPlay involves you hard-wiring your computer to the Air’s ethernet socket using the supplied cable. You need to open a network connection on your internet browser, give the Zeppelin a name and allow it to access to your wireless network. The whole process is painless and takes just a couple of minutes. Select the Zeppelin Air via the Airplay menu in iTunes or the icon on your iPhone’s screen and, after a brief pause, music will stream through the Zeppelin. Simply repeat the process if you want to connect multiple Airs. The AirPlay functionality works well given a stable wireless network, but we still found that compared to hard-wiring or docking your device, sound quality does take a slight hit. A slight edginess is introduced and dynamics sound a little diluted – but not to a drastic extent. The first-generation Zeppelin took the analogue signal from a connected iPod; the Air takes the digital data stream and uses its own internal DAC to process the signal. And, it does so with spectacular results. It’s a big step up from its predecessor. The first thing to hit you is the bass. There’s a decent sense of weight and impressive depth, and it sounds tight and sharply defined too. Spin Nelly’s Just a Dream, and the Air delivers all the low-frequency heft of the thumping bass line, yet rules it with an iron fist. Crank up the volume and it doesn’t bottom out or distort. The Zeppelin Air’s impressive sense of timing means that it laps up The Strokes Under Cover Of Darkness and its zesty, upbeat tempo. Switch to Ellie Goulding’s cover of Elton’s Your Song and her sweet vocal sounds natural and full of emotion. The subtle dynamics of the piano in the background help add to the feeling and emotion created by the lyrics. B&W provides a tone control located in your iPod/iPhone’s menus that you can adjust, depending on the positioning of the Zeppelin. It ranges from +1 to -3, and is worth experimenting with – but we found ‘0’ produced the best balance. The USB input fitted to the Zeppelin Air is used for firmare updates – and you can now sync a docked iPod or iPhone. You can also stream music directly from your laptop’s USB socket. Of all the listening methods, we found this to give the very best sound quality, just edging out a docked iPod/iPhone in terms of dynamics and detail. Irrespective of the way you chose to enjoy your tunes you won’t be disappointed because the general standard of sound quality is so high. The Zeppelin Air sounds great, functionality is much improved and sound quality is a step ahead of the original. Is it good enough to be crowned king of premium speaker docks? We shall see.